Microgrid are integral to initiatives that aim to strengthen the economy, save lives during natural disasters, and make our energy supply more sustainable and our electrical power more secure. 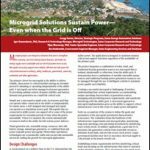 Microgrids increasing support more reliable, efficient and safe power for critical infrastructure. To learn more download this white paper.